Mexico would be able to stop importing maize if it promoted peasant agriculture, more efficient water use and investment in small-scale farmers. MEXICO CITY, Oct 24 2012 (IPS) - It has been many years since Mexico, the birthplace of maize, has been self-sufficient in this staple food that plays a central role in its cuisine and culture. But new studies indicate that it could produce enough maize to meet its needs within 10 to 15 years. For farmer Carmelo Pacheco, in the southern state of Guerrero, what he and other Mexican maize producers need is more irrigation to increase crop yields. “For this year the prospects are average,” said Pacheco, leader of the Pach-Vill growers organisation in the municipality of Ayutla de los Libres, where the harvest is about to begin. “Production has fallen because of changes in the climate, and prices are not solid,” he told Tierramérica*. Investing in irrigation and infrastructure projects in the southeast and providing financing for small- and medium-scale farmers would allow this Latin American country to regain its self-sufficiency in maize production, according to the study “Achieving Mexico’s Maize Potential”, released this month. “The predominance of the extractive use of resources has resulted in erosion and inefficient irrigation. The country could take better advantage of its land and freshwater reserves, available technology, peasant agriculture and genetic diversity,” said Antonio Turrent, a senior researcher at the National Institute of Forestry, Agriculture and Livestock Research and one of the study’s authors, along with Timothy Wise and Elise Garvey, director of policy research and researcher, respectively, at the Global Development and Environment Institute (GDAE) at Tufts University, in the United States. Within 10 to 15 years, Mexico could increase its annual maize production to 33 million tons, meeting the current deficit of 10 million tons, and could even add another 24 million tons to meet its growing demand, expected to reach 39 million tons a year by 2025, states the study, published in English by the GDAE and in Spanish by the Woodrow Wilson International Center for Scholars, based in Washington. Mexico currently needs to import between eight and 10 tons of maize a year, mostly from the United States. The country has some three million maize producers who raise the crop on an area of eight million hectares. But more than two million grow maize for their own family consumption. Domestic production focuses primarily on white maize, while yellow maize, used for animal feed, is imported. Maize (Zea mays) is a symbolic crop in Mesoamerica, the region covering southern Mexico and Central America, because of its vital importance in pre-Hispanic culture. Mexico is the birthplace of maize, and has 59 landraces (native strains) and 209 varieties of the grain. Only 10 landraces have been used in genetic improvement. If the efficiency of irrigation were improved by 60 to 70 percent, it would be possible to extend cultivation to another 4.1 to 4.9 million hectares, using runoff water, which is abundant in south and southeast Mexico. The researchers rule out the need for biotechnology, the government’s strategy for raising productivity and resistance to the effects of climate change. Transgenic maize is a “false and dangerous promise” that has not led to higher yields than native or traditionally improved seeds, represents a threat to native varieties and biodiversity, and has not proven to be more resistant to drought than other varieties, they maintain. Since 2009, the Mexican government has authorised 177 permits for experimental and pilot planting of genetically modified maize on an area of 2,664 hectares. In September, the U.S.-based transnationals Monsanto, Pioneer and Dow Agrosciences submitted six requests for authorisation of commercial planting of transgenic maize on some 1.7 hectares of land in Sinaloa (northwest Mexico) and Tamaulipas (northeast). Mexico has some eight million hectares of arable farm land that are not being used and which “offer an opportunity to start from zero to confront the food crisis and high food prices,” researcher Antonio Yunes from the College of Mexico, a public institution, told Tierramérica. “This potential could be harnessed without the need for subsidies, by using sustainable practices,” he said. In 2011, 549 million dollars in subsidies were granted to producers, including 15 million dollars to the organic agriculture sector. 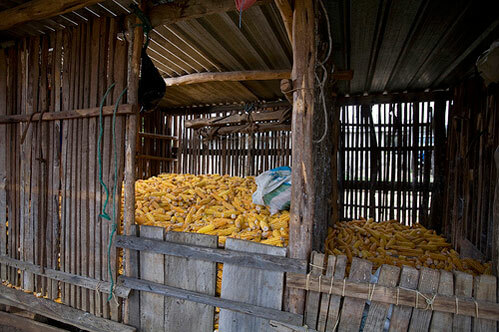 In the southern state of Guerrero, maize producers also plant hibiscus, sesame and squash. But “there are no guarantees of production, we need to be better organised,” said Pacheco.